In 1973 Audubon Scientist Stephen Kress began an experiment. He had decided to try to restore a puffin colony on and island off the coast of Maine called Eastern Egg Rock. There once were puffins on Egg Rock, but people had hunted them and the colony had been destroyed. People had destroyed bird colonies like this before, but no one had ever tried to bring one back. Stephen wanted to try. 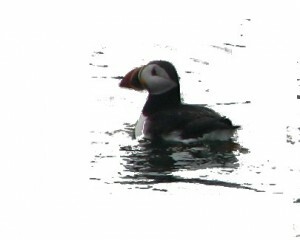 First Stephen took a trip to Newfoundland, Canada, where there is a huge healthy colony of Puffins. With the help of scientists and volunteers in both countries, Stephen brought puffin chicks that had just hatched in Canada down to Egg Rock. He and his volunteers raised them on Eastern Egg Rock. At the end of the summer, the Puffins went to sea. Stephen knew that puffins come back to the island where they were born in order to raise their own chicks. But he also knew he would have to wait. Puffins don’t come back to their island for several years. Would any come back to Egg Rock? Stephen and his volunteers brought Puffin chicks to Egg Rock for eight summers before he knew the answer. Puffins returned to Eastern Egg Rock to make their nests! The experiment was a success. Today over 100 pairs of birds nest on Egg Rock each summer. You can read more about Stephen Kress’s story in the children’s book Project Puffin: How we Brought Puffins Back to Egg Rock by Stephen Kress as told to Pete Salmansohn. Teachers may also enjoy the Teacher’s Guide to this book by the same authors. Today Project Puffin continues to restore and protect several puffin colonies along the Maine Coast. Thanks to their efforts, puffins once again flourish along the coast of Maine.